New York Yankees outfielder Aaron Judge was injured in the team's recent game against the Kansas City Royals, and the fans in attendance at Yankee Stadium expressed their support for him by holding a vigil. Captured on video by Eric Hubbs, a writer for Barstool Sports, the fans at the stadium spontaneously decided to hold a "candlelight" vigil for the injured slugger. Cellphone screens were shining bright in different areas of the stadium. People seated in the area near the foul line all the way up to the nosebleeds were showing their support for Judge. Sports Illustrated also reported that fans held their illuminated cell phones up in the air during the seventh inning. Judge's injury stems from something that took place in the first inning of the Yankees' game against the Royals. Facing Royals right-hander Jakob Junis, Judge was emerging from his batting stance when a 93 mph fastball from Junis came darting inside and ended up hitting him on his right wrist, MLB.com reported. Judge was visibly upset with getting hit and he tossed his bat to the side as he walked to first base. The 26-year-old hitter was checked on by manager Aaron Boone and head trainer Steve Donohue immediately after. Judge actually remained in the game after getting hit by the pitch, even getting an infield single in the third inning. He was later examined by the team's doctor and lifted from the game. After undergoing an MRI and CT scan, it was revealed that Judge sustained a chip fracture to his right wrist. No surgery is needed for the injury, but Judge is expected to be out of action for the next three weeks. Still, a report from NJ.com has revealed that the injury is not as bad as some fans might have expected. 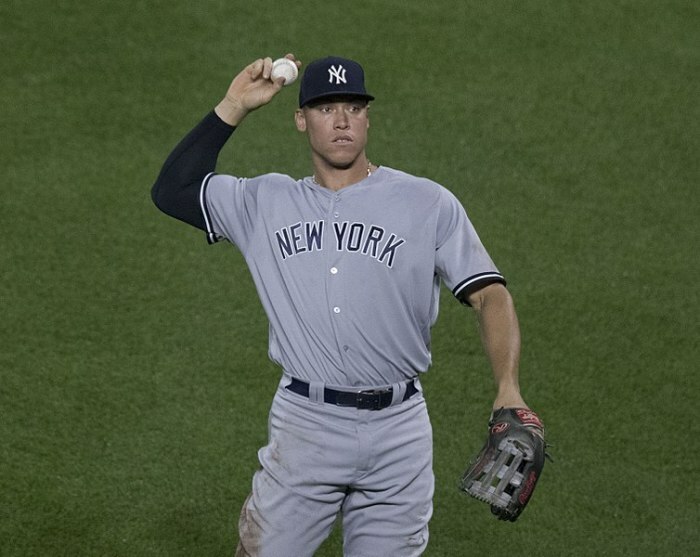 While some have speculated that Judge could be out of action for a month or even longer, Boone said that the three-week recovery timeframe for the outfielder is "very realistic." Prior to the injury, Judge had a batting line of .285/.398/.548 and he had also bashed 26 home runs, which leads the team. He is also tied for first place on the team in terms of runs batted in (61) with fellow slugger Giancarlo Stanton. With Judge sidelined for a while, Stanton is expected to get the majority of the starts in right field, according to Boone.